I just recently updated to Windows 10 Creators Update. After the update, I'm experiencing a sort of delay whenever I clicked on anything on my desktop. Clicking the icons, right clicking. Everything has a delay on it. So I tried disabling Fences and voila! Instant response. I tried uninstalling and reinstalling Fences, but performance is still the same. Any help or suggestions would be truly appreciated. Thank you! I'm on Windows 7, .. and am experiencing the same lag since updating to Fences 3.04.12 yesterday. Likewise, if I disable Fences, .. then the lag disappears. Hope there's a fix, .. or some resolve soon. Alternatively, . is there any way to roll back to 3.03 ? I have the same problem after upgrading to version 3.04. Fences I have returned to version 3.03 after uninstalling 3.04 with Revo Uninstaller. I can confirm reverting back to Version 3.03 fixes the lag problem. Sigh. Please contact support so we can see what you have in common. If you are using an Intel graphics card the issue may be with it's entry in the right-click menu. If you are comfortable with tweaking the registry you can download the following, unzip it, and double-click and it will disable that entry and should resolve the issue. Hi, thanks for the suggestion, but I'm using a Nvidia 1080ti. I'm having this issue on Windows 10 with a Nvidia based card as well. I had to disable my Fences because when I double clicked icons it was hiding my icons instead of opening the program. Same problem here. Win10 and Nvidia. I am about to uninstall fences to be honest. i went ahead and got rid of 3.04 and went back to 3.03. While there still is noticeable lag - it is way better than with 3.04. Please right-click on the desktop and take a screenshot of the menu. For those seeing lag . . .
We would appreciate if you could run two tests ONE AT A TIME and let us know if there is any difference. I tried the first batch file and it gives an error. Fences appears to stay enabled after doing this. I'll try restarting the computer to see if that makes a difference. Edit: I should note that when I disable Fences the "normal way" through the preferences screen, that the lag does go away. 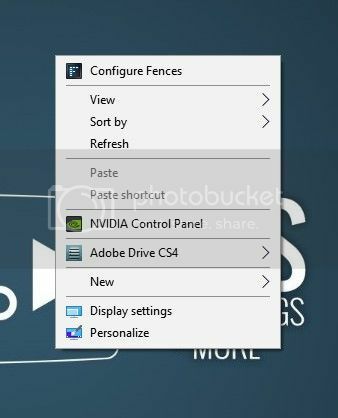 What is the path to the Fences exe on your PC? Don't worry about it. I modified the batch file to grab the install directory from the registry. I also am suffering with very slow response time with Fences 3.0.4.12 on Windows 10 Version 1703 (OS Build 15063.296) 64-bit. I have Nvidia based chipset integrated graphics (slow). This delay affects every interaction with icons: left clicks, right clicks, drags, and double clicks. Double clicks on an icon often trigger the hide all icons feature as well. There is no delay when Fences is disabled. So I fired up Sysinternals Process Monitor and spied on explorer.exe while Fences was running. There was significant registry accesses during clicking on items on the desktop. There were two frequently repeated patterns that were not present when Fences was disabled. Executed for each of the 187 icons on my desktop it takes about 210ms total time for the sequence on my machine. This sequence executes twice for each item I click on. (Once when the icon is selected and one when deselected? Not sure.) That's about 420ms total time per click. The next sequence seems to have something to do with showing the version number of Windows on the corner of the desktop. This sequence repeats at intervals of about 11ms. (Every time the desktop is repainted?) It is repeated 50 times for every icon I click on for about 550ms total per click. Altogether these two sequences seem to account for about 970ms or almost one second of delay per click. Which seems about right. Same problem here with Win 10 Pro 64bit 1703 Creators. The latest Fences is the problem. Any click activity is a 3-5 second delay. Double left click often turns off all the icons. Reverting to 3.03 makes it better but not perfect. With no Fences installed instant response. The latest beta is released with bug fixes. Just tried the new Beta .. i.e. 3.05 .. and the problem with the delay persists ..
.. rolling back to 3.03 resolves the issue. I already posted in the official release thread but yes, the lag is still there on the beta version. Updated to the new Beta 3.05. Yup lag is still there. I purged the old version, then renewed to the beta. Initially its working properly, then lag starts after restoring my snapshot. Yes i have a lot of icons. Any news ? 3.05.12 still has this problem. Any workaround ? Any progress on this issue? There has been radio silence from Stardock on this killer issue. I am still using v3.0.3 which is just about tolerable with Windows 10. I have around 180 icons and folders on my desktop spread over 2 monitors. The current 3.0.5 has 4-5 second delay when trying to do anything (left or right mouse click). More often than not a left double click will autohide all the icons. In other words it is entirely unusable. Disabling Fences gives an instant response to any click on the desktop. If you change the windows explorer option to "Single click to open an item (point to select), the response is better. (a bit like using a Mac!). The other workaround is to pin a shortcut to the taskbar which is, by default, a single click to open, and is not a desktop icon. Either way the problem is still there, whether it is caused by the Creator's upgrade or by Stardock Fences, I do not know. I am just a very disgruntled user who will not be recommending Stardock software to anybody else.